In every sales process for every SaaS startup, there is one ultimate internal champion advocating the purchasing decision. And it’s their budget that will be used to pay for it. So, which departments within customers spend most on SaaS? One way of looking at this question is to compare the successes of software companies targeting different departments. I have categorized the 50 or so publicly traded SaaS companies by their principal buyer, and tallied the aggregate market caps of those companies above. Software companies targeting Human Resources and Sales teams are in aggregate each worth about $50B. Next, companies targeting IT are worth approximately $40B. After that there’s a steep decline to about $10B for Finance and Marketing. As the table above shows, the Sales category is dominated by Sales force, which represents 92% of the market capitalization in that category. It is a bit unfair to lump all of Salesforce’s revenue into sales because the product spans sales, marketing and support. Nevertheless, the majority of the revenue remains from sales teams. The next most dominant company in a category is Zendesk which represents 77% of the Customer Support/Success market cap today. Then there is New Relic, NetSuite, and LinkedIn all about 50% of their categories. How should these trends change with time? I suspect sales will always be in the top one or two categories, because if software enables a sales team to be more productive, and it is ROI positive, then there’s always the case to be made to buy it. The same is true for Human Resources. Companies are always looking to hire, and tools that provide them competitive advantage in recruitment can be very well justified. Surprisingly, Marketing is on the smaller end of the spectrum. Gartner has forecasted that by 2017 CMOs will spend more money than CIOs, which should eventually translate to substantial increases in the aggregate market caps of marketing SaaS companies. The Engineering and Customer Success categories are both relatively new. It’s only recently that the consumerization of IT has led to substantial spending on tools by engineering teams. 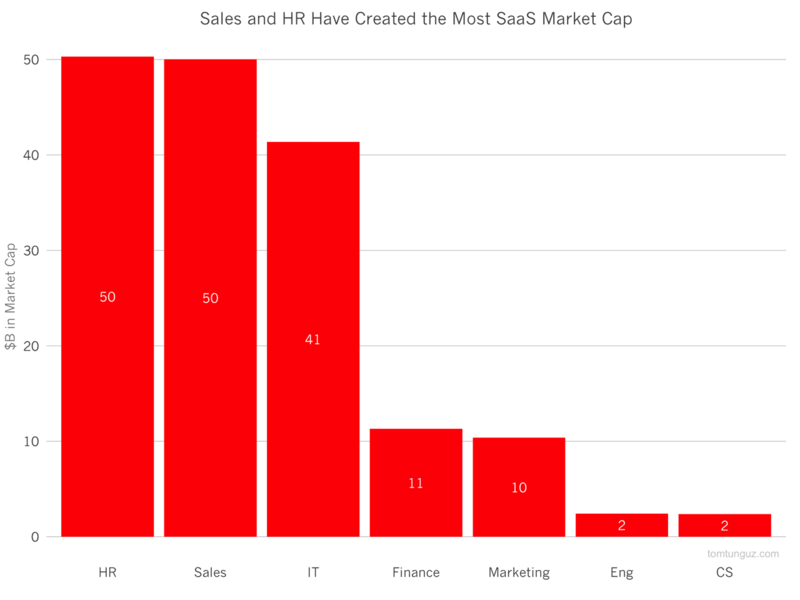 One blind spot in this analysis is it fails to look at the total value of SaaS acquisitions. If we were look only at the top six, they would add about $50B or so to the data set. out of the top six largest acquisitions, three of them are for Human resources companies: Taleo ($1.8B), Kenexa ($1.3B) and SuccessFactors ($3.6B), so this data would likely only further skew the existing results in favor of HR. These historical trends are interesting, but it’s very difficult to use them to predict the future. And, after all there are quite a few fast-growing software companies scaling very quickly that should go public in the next few years that could meaningfully skew this data.